Bluesfuze Strat Tones for the Florida Keys!! Ever been down to the Florida Keys? It's definitely on my list of places to visit, along with Austin, Atlanta, Memphis, New Orleans, etc. Great live music scenes, especially when you need a fix of good roots music & culture! I recently saw the Keys profiled on a couple of those foodie shows and was really jazzed about the club scene there. If Anthony Bourdain likes it-- I'm goin'! Good food, good nightlife and GOOD BLUES!!! Ric "Bluesfuze" Arra is a Florida based, classic, no B.S. 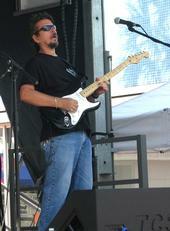 blues guitar player who gigs a lot down in the Keys area. 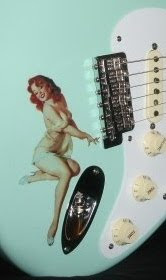 If you like no-nonsense real Strat tones and players like: Ronnie Earl, Charlie Baty, Duke Robillard and Sue Foley, players with a little dirt under their fingernails, you'll surely get into the Bluesfuze! According to the bio on Ric's myspace page, he actually works with a couple bands as a hired gun; bands who have shared the stage with class blues acts from Coco Montoya to BB King himself. Lot's of rich Blues DNA around this cat folks! So stop by www.myspace.com/bluesfuze for a taste. In addition to his tunes, there's a current gig schedule for anyone in or near the Florida Keys, or traveling there soon for bidness or pleasure. And if you're a myspace member, be sure to friend-up!! Let's keep those musician family values going! That oughta cover it!! BLUESFUZE folks-- where the Mojito's flow freely! !